Willem de Kooning was the archetypal Action Painter, and as such was one of the most influential artists of the post-war era. On the American side of the Atlantic, a number of painters would feel that it was his legacy, rather than Picasso’s, that they had to overcome in order to continue. Alongside Jackson Pollock, he is considered one of the foremost of the Abstract Expressionists – despite the fact that the label did not accurately apply to his works, which were often rooted in figuration. That figurative root was hardly surprising in an artist who had studied at the Academie van Beeldende Kunsten in Rotterdam and had gained an incredible technical mastery. At the same time, he was well-versed in the history of art; his pictorial erudition itself provided a fertile ground for his later development as an artist. De Kooning moved to New York in 1927 and came into contact with members of the avant garde there, including Arshile Gorky in particular, who was to become a revelatory influence upon him. 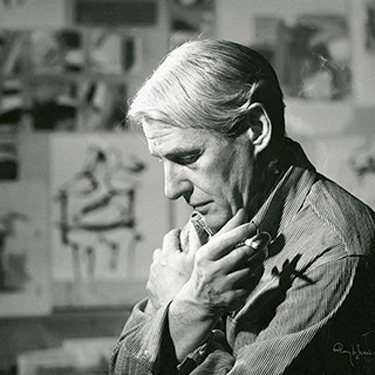 De Kooning was involved, as were so many of the artists of his generation, in the Federal Art Project run by the Works Progress Administration. During that time, De Kooning explored abstraction, as well as creating paintings of both men and of women, the latter subject setting into motion one of the most celebrated series of pictures of the modern era. By 1936, De Kooning was being included in the New Horizons exhibition at the Museum of Modern Art, New York – an institution which now owns a significant holding of his pictures. During the 1940s, De Kooning moved further towards the vigorous abstraction with which he is best associated. One of the great watersheds of his career was his first one-man show – at the age of 44 – at the Charles Egan Gallery in 1948, that annus mirabilis of Abstract Expressionism. His works from this period eschewed any sense of perspective, instead focusing on the surface, be it in works that merely had flickering glimpses of the figurative, as in the churning, visceral Excavation at the Art Institute of Chicago or others such as Woman I (Museum of Modern Art, New York). The sheer, explosive gestural application of paint was evident in the damage occasionally wrought to the surface by the artist, demonstrating the aptness of the term Action Painter. Meanwhile, the surface also featured erasures, scrapings and abrasions that lent an extraordinary sense of texture. His use of colour was itself highly evocative, with elusive hints of flesh appearing throughout. After all, as De Kooning said, ‘Flesh was the reason oil painting was invented’ (de Kooning, quoted in B. Hess, Willem de Kooning 1904-1997: Content as a Glimpse, Cologne, 2004, p. 8). De Kooning’s pictures of women are among the most recognised of all his works, especially Woman I, which features a cutting from a magazine in place of the painted figure’s mouth. For De Kooning, an artist so steeped in the history of art, the challenge of depicting women in the wake of figures such as Rubens, Rembrandt, Ingres and Picasso presented a unique challenge, especially against the backdrop of the emergence of abstract art. ‘In a way, if you pick up some paint with your brush and make somebody’s nose with it, this is rather ridiculous when you think of it, theoretically or philosophically,’ he explained. ‘It’s really absurd to make an image, like a human image, with paint today, when you think about it, since we have this problem of doing or not doing it. But then all of a sudden it was even more absurd not to do it. So I fear that I’ll have to follow my desires’ (de Kooning, quoted in D. Sylvester, Interviews with American Artists, London, 2002, p. 48). During the 1950s, De Kooning turned increasingly to the subject of landscape in his pictures, initially painting his urban surroundings and then, following his move to East Hampton, more light-filled visions. The sense of water infused his pictures, which sometimes featured a painterly liquidity that would remain in his later abstractions, filled with meandering ribbons of colour. De Kooning also became involved in sculpture, even receiving the encouragement of Henry Moore, creating works such as Clamdigger of 1972 that were filled with a gestural energy reminiscent of his picture surfaces.